– one-star review. Really? if you’re not in the mood to eat, don’t eat, and certainly don’t review it. – one-star review. Oh man, you mean, he made an honest mistake? How awful for you to have to ask to get your beers replaced. Online review sites are wonderful and terrifying at the same time. Totally wonderful in that they help us find that great little place that’s just right for us – best breakfast in town; great place to grab a beer; emergency 24-hour dry cleaner; you name it. They democratize the customer service process and allow consumers to do better due diligence before they make purchase decisions. They also bring small business owners to their knees, giving the customer perhaps too much power, and we all know what happens when someone has too much power: The abuse of power. When I received an email from a restaurant owner wringing their virtual hands because they had a horrible one-star review detailing their experience and what the “big juicy bug” looked like in the salad, I feel bad for these owners, at the mercy of the Jerk. And with good reason: A Harvard Business Review study of restaurants in Seattle shows that a one-star boost in your Yelp rating can lead to a five to nine percent boost in revenue. 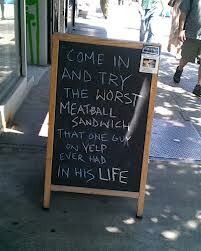 Hate Yelp as much as you want to, but it matters to small business, and it puts your customer in control. Which is OK, if your customers aren’t assholes. Instead the guy went home and took to Yelp to write a long review about the big gross bug and how their meal didn’t get comped. Call people out on it. Don’t worry about the jerks; worry about the nice people who will come by later and read what the jerk wrote. More than likely you’re not going to turn this guy into a fan. Maybe you will; but do you care? Do you really want him back in your business? Probably not. However, you do want all the nice people who come by later and read that review, whether as part of their due diligence or like me, for pure entertainment value, to know you care and responded, and for them to make the assumption that this guy is a jerk. Don’t let the jerks win by taking this stuff personally. If you let them affect you, you’re going to spend a lot of time on a roller coaster ride with one- and five-star reviews. Man o’ man. Take a deep breath, don’t obsess on your reviews, and manage them accordingly. Don’t let these people bring you to your knees. Don’t lash out – be cool. And know this one-star review will absolutely not be the last one. Yes, you, my friend, have many one-star reviews in your future. Listen, dear business owner: Your prospects and customers are smarter than you give them credit for. Do what you do and continue to do it well. Most of us know what to look for when researching a place of business. We expect businesses to have a negative review here and there – we wouldn’t trust it if you didn’t. We also know there are many people out there who fancy themselves the next New York Times food critic and are total jerks enjoying their power at your expense. But it doesn’t have to be at your expense if you keep a level head about this stuff and don’t go off the deep end lashing back at your community like Amy’s Baking Company did or offer a 25 percent discount if you give a one-star rating just so you can be the lowest rated restaurant on Yelp and supposedly “tank the system” on your own. Because that stuff might be cute and clever (in the latter scenario), but it’s not why I want you to get on national news. Really. That’s when “they” win. As a conservative, I have three businesses that were regularly trashed by “customers” on Yelp. What is truly reprehensable is they don’t allow a rebuttal option like the one that Ebay uses, so there is no recourse. To that end, I refuse to put any of my businesses in Yelp anymore and removed them. There is no sense in it, and if people want to find my businesses they go to other search engines anyway. I am also in LinkedIn, Facebook, and write timely blogs in all of the websites for my businesses. Hey GOPcongress, I know this replay is about 18 months after your original posting, but I was wondering how you were able to get your businesses removed from Yelp’s listings. I had a horrible experience with Yelp several years ago with one of my businesses – someone who was harassing my staff members (and who we wound up having to get a court Order of Injunction Against Harassment against) wrote a really unhinged review of the business that was purely out of spite & personal vindictiveness. I contacted Yelp & told them all the details about this person & the trouble we had been having with him, and showed them how his review had actually violated no less than 3 of Yelp’s own guidelines for posting reviews. They refused to do anything about it, and would not remove the review. Fast forward to today: I find out that last week a Yelp review page was created for my current business. I did not create it, request it, or authorize it. I contact Yelp to tell them to take it down – it has no content on it, no posts or reviews or anything. They refuse, and say that once a business is listed on Yelp, there is NO WAY for the listing to be removed. I went up the chain, talked to supervisors/managers, etc. and each one was more arrogant and smug than the one before. Who gave Yelp this kind of power over businesses? I’m curious bout how you were able to get your businesses unlisted – any tips for dealing with these guys? Thanks. Yelp is a whore, just like Napster, Pirate Bay, etc. They feed off of small businesses by creating a review site for businesses without ever asking for permission. Unlike the Better Business Bureau, negative reviews remain, often permanently damaging the business, in spite of corrective efforts. Their “sacred” Yelp algorithm flags legitimate reviews. They have a constant turn around of sales people who call and harass your business routinely asking for money, to” enhance” your Yelp site, which feels like extortion. I’ve discovered that my Yelp site has had its store hours tampered with along with a description of my company. Yelp claims that the public can freely modify your business details on their site, which is totally unacceptable. This is not freedom of speech, but rather a whore of a company that feeds off of small business owners who are terrified by permanent negative Yelp reviews. Small business owners often work six to seven days per week and must face all kinds of risks, including careless employees. There are serial Yelpers who can’t wait to write a negative review and have no understanding how damaging it can be. Yelp is merely a conduit for libelous behavior and it will be challenged in the courts one day. Yelp does not care about the damages that they cause to hardworking small businesses, their interest is purely financial.